Tuesday October 1st 1878 We started before it was light to go to Burlington. We had a pleasant trip. And I took everybody by surprise. The folks at the house were very busy. I guess there was three hundred took dinner there. After the dinner was over Bird and I went down to see the crowd some bace from hearing Blaine speak. When we got back found Rob at supper and I sat down to eat. I had a call from Mrs Hadgeman and as soon as she went Rob and I went out on South Hill to call on Mr Forneys people. We had a very pleasant call. I went to bed soon after we got home. I lost my little gold heart today. 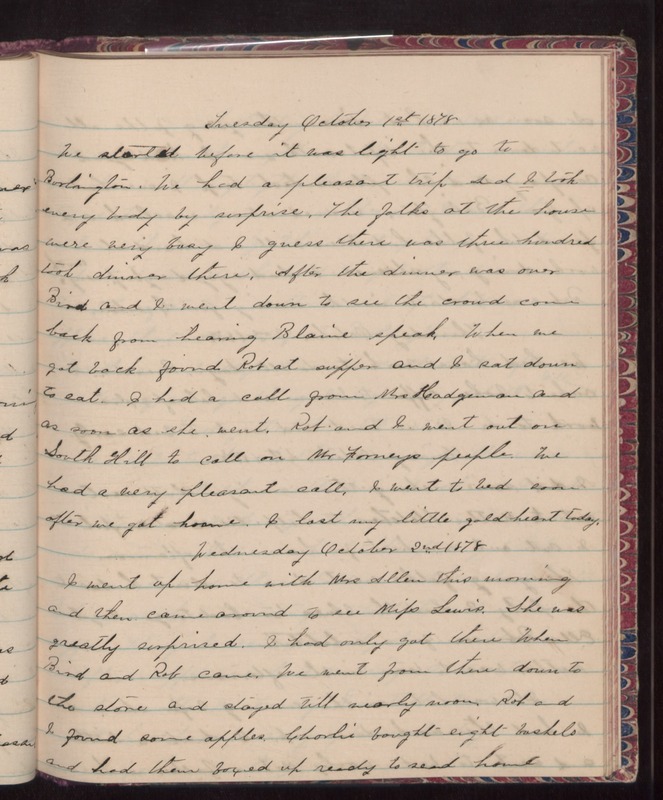 Wednesday October 2nd 1878 I went up home with Mrs Allen this morning and then came around to see Mifs Lewis. She was greatly surprised. I had only got thru when BIrd and Rob came. We went from there down to the store and stayed till nearly noon. Rob and I found some apples. Charlie bought eight baskets and had them fixed up ready to send home.